A neuroma is an abnormality of a nerve that has been damaged either by trauma or as a result of a deformity of the foot. Neuromas occur most often in the ball of the foot, causing a pinched and inflamed nerve. 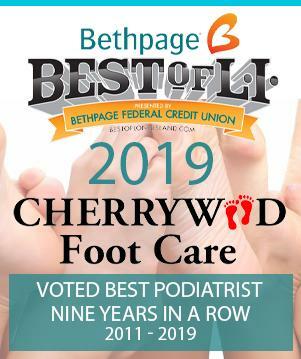 In cases of chronic nerve pain from neuromas, we at Cherrywood Foot Care recommend surgery. Neuroma surgery is generally performed on a same-day outpatient basis using a local anesthetic. The incision will be covered with a dressing after the surgery, which must be kept dry until the sutures are removed, usually within 10 to 14 days after the operation. Most patients are sent home with a surgical shoe, although crutches may be recommended in cases where the incision must be made on the bottom of the foot. Keeping the foot elevated and iced are important in the first few days following surgery to reduce swelling. Patients are generally restricted to limited walking until the sutures are removed. Generally, patients can return to normal shoe wear in about three weeks. The overall recovery time is usually four to six weeks.